If you don’t have knowledge, you have to rely on something else. WHAT IS THIS PLACE? The Feline Café is my adult photographic cat blog. I post my own original photographs. I write my own original text. The purpose here is primarily to amuse. I am more of a weekly poster, but sometimes I do more. NOTE: I do not use WordPress Reader to follow blogs. I generally follow bloggers who do their own original writing and photography. I wish I could follow everyone but that is impossible! ABOUT ME: I am aged 70+. I live near Tacoma, Washington, USA. I have lived in the U.K. and traveled some. I am retired now. Like cats, old photographs, and short blog posts. I love history, science, and the classic novels. I worry for the planet’s wildlife in total, but I think it is too late for the animals of our world. Re-learning or “improving” my German, so you may see a bit of it on the blog or comments section. I watch too much TV and too many movies. I blogged as one diversion from that. I feel I should state here that I am in a romantic relationship with a woman cat blogger Christine . We are on the verge of a great new adventure. Things are changing. As far as this blog post content is concerned, If you read something serious here, you must have misunderstood. 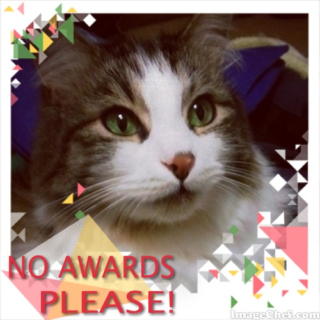 No awards please! Too much work!! (Übersetzer/Abonnement oben links Mappe-Knopf) (Subscriber and other info press the folder button left top corner. “Anonymous” comments are not permitted and not posted! Far off topic comments may be deleted. Comments with a “link” are prohibited in general, with a few exceptions. I reserve the right to delete any comment for any reason.